A standard IVF procedure makes use of eggs from the intended mother to help a couple realise the dream of having a child. However, this is possible only when the woman has a sufficient number of good quality eggs to be utilized for assisted pregnancy. The quality of eggs is of paramount importance in fertility treatment as IVF with poor quality eggs greatly jeopardises the likelihood of a successful outcome. In cases of advanced maternal age, poor ovarian reserve (low number of eggs remaining in the ovaries) or poor egg quality, donor egg IVF has proven to be an effective solution to the problem of infertility. At Gaudium IVF & Gynae Solutions Centre, IVF with donor eggs has helped hundreds of couples have a child of their own. Your doctor may also suggest donor egg IVF when the patient has not responded well to ovarian stimulation during a typical IVF cycle. In simpler words, if treatment with fertility medication has failed to develop the desired number and quality of eggs, your doctor will explain to you the possible repercussions of continuing treatment with sub-quality eggs, and discuss donor egg IVF as an alternative. Couples opting for gestational surrogacy where the intended mother cannot provide good-quality eggs may consider donor egg IVF as a viable option. Couples opting for donor egg IVF at Gaudium IVF may opt to utilize fresh eggs from a known donor or frozen eggs from a donor bank. 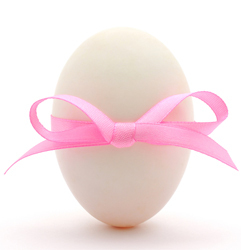 We provide complete end-to-end assistance to our patients in obtaining frozen eggs from an accredited donor egg bank. When a donor bank is used, the eggs are carefully screened and thawed to a temperature optimum for fertilization. In case of fresh donor eggs, the donor receives medication to stimulate her ovaries to develop and release several mature eggs. Through this period, she will undergo blood tests and ultrasound scans to monitor egg development. Concurrently, the recipient receives medication to suppress her natural ovulation cycle to stop her ovaries from releasing eggs and to prepare her uterus for embryo implantation. Once mature, eggs are collected from the donor through a simple procedure known as egg retrieval and combined with sperm from the recipient’s partner in a lab to enable fertilization. Once they are sufficiently developed, one (in some cases, two) of the resulting embryos are placed in the patient’s uterus to enable pregnancy. The embryo transfer is a simple outpatient procedure and does not require hospitalisation. The remaining embryos can be cryopreserved for a future pregnancy.